Your business is important, and this extends to your business’s assets. Sometimes essential documents, files, valuables, and personal items need to be under lock and key. Not to mention, many workplaces have a storage area or break room where employees need to be able to safely leave personal articles, such as mobile devices, keys, extra clothes, or even just their lunch. Others need a secure place to store equipment or tools, indoors or outdoors. 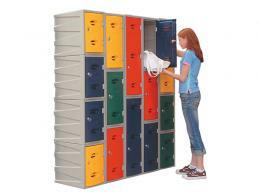 Plastic lockers are an affordable solution to storing valuables while keeping things safe and organized. The Workplace Depot’s lockers are durable, appealing to the eye, and suitable for most budgets and storage needs. Whatever your space requirements or limitations, these lockers will fit the bill – they’re stackable, lightweight, and come in small, medium, and large sizes. These are available in a number of attractive colours – blue, red, green, or yellow – and will match any style of décor. For your office, leisure centre, workplace gym, or storage room, our lockers are the perfect storage solution. Our Shower Duty and Storm Duty lockers will withstand continual contact with water with zero chance of rust or corrosion. Perfect for wet storage areas like shower/changing rooms or outdoor placement. 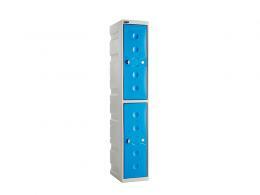 These heavy-duty lockers are adaptable for any kind of storage need and come in two neutral colours. Use them in warehouses, workspaces, shops, outdoor areas, and more. 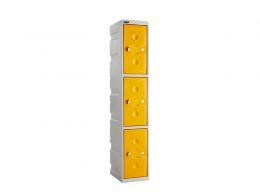 There are many features that make our lockers stand out. They’re made from tough polyethylene and recycled medium-density polyethylene plastic, so they’re strong, durable, and suitable for both indoors and out. This means they can withstand high levels of moisture or humidity, are resistant to rust and corrosion, and are easy to clean. The Workplace Depot offers one year parts/labour warranties on our General Plastic Lockers and Multi-purpose Storage Lockers, and a 10 year parts/labour warranty on our Water Resistant Plastic Lockers to protect your purchase.